A few weeks ago, I read Ghosthunters: A Journey through Haunted France by Simon Marsden. In it, he briefly discusses the tape recording theory. The theory "proposes that certain inanimate objects, such as stone or wood, that are frequently found in ancient buildings, are capable, because of their chemical make-up, of storing extreme human actions and emotions such as violence, fear and suffering, similar to how modern recording techniques store images and sounds." The notion of inanimate objects storing powerful or poignant memories must have been lingering in my subconscious, like a specter in an abandoned attic, because it was the first thing I thought of when I happened upon the Christie's website and saw gold alliance rings once owned by the Duc de Chartres and his unfortunate wife. Allow me to tell you a little about the Duc de Chartres. Only then will you understand my leap in reasoning. Louis Philippe Joseph d'Orléans was a French nobleman. He was not just any old French nobleman, though. He was a member of the Bourbon family, a cousin by blood to Louis XVI. On 5 April 1769, he married Louise Marie Adélaïde de Bourbon (yes, they were kissing cousins). Adélaïde was a pretty woman with porcelain skin, a slender physique, and melancholy expression. Although she was madly in love with Louis Philippe, theirs was not to be a matrimony of bliss. He simply did not return her affections (though he was rather fond of her enormous fortune). A libertine of the first order, Chartres conducted numerous liaisons. While poor Adélaïde was giving birth to their first child, a stillborn daughter, Chartres was carrying on a clandestine liaison with one of his wife's ladies-in-waiting. Chartres even kept a list of all of the women he knew divided into seven categories: beautiful, pretty, passable, ugly, frightful, hideous, and abominable. My disdain for the Duc de Chartres was evident in my novel The Queen's Folly, where, drawing upon contemporary journals, I had him crushing rats beneath his heal and forcing himself on pretty, young servants. I have a more compelling reason for disliking the duke: he was a bitter enemy of my beloved Marie Antoinette. In fact, he funded the production of countless pornographic pamphlets the disparaged the queen. One featured Marie Antoinette and her dearest friend, Princess Lamballe (who, incidentally, was Adélaïde's sister-in-law), involved in oral copulation. 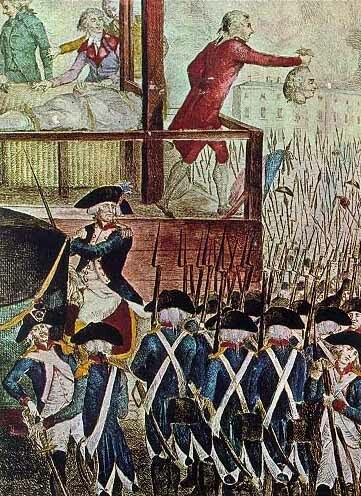 In 1793, in the ultimate show of disloyalty and hypocrisy, Chartres cast his vote in favor of sending Louis XVI to the guillotine. Louis Philippe Joseph d'Orleans, a prince of the blood, one of the most powerful aristocrats in all of France, condoned and supported regicide. His actions deeply wounded his wife, Adélaïde. She did not agree with his political waffling, nor his underhanded, spiteful tactics. In Ghosthunter, Marsden writes that the memories stored in inanimate objects could be replayed if the conditions were right, if the people present were "sensitive to such paranormal emanations." I know. It sounds like a ridiculous heap of stinking crap, doesn't it? Still, I can't help but wonder if the rings of the Duc and Duchesse de Chartres would emanate any particular memories. Would they project the hope and joy the young, naive Adélaïde must have felt when her dashing duke slipped the bands on her finger? Or would they convey the heartbreak she suffered when she first discovered her husband was as faithless as a hound in heat? Or perhaps the slender golden bands would emanate the profound sorrow Adélaïde surely felt upon learning that her gentle, sweet, much beloved sister-in-law, Princess Lamballe, had been raped, mutilated, and decapitated, her head stuck on a pike and marched through the squalid city streets. As I look at the golden rings, I can't help but wonder if the fracture in one of the bands is a physical manifestation, a very real representation, of the Duc and Duchesse's marriage. . .for their's was surely a fractured alliance. A final thought occurs to me, several months after Chartres cast his fateful vote, he was convicted of treason and condemned to death. On 6 November 1793, Chartres followed in his cousin's footsteps and mounted the scaffold. The razor sharp blade forever cleaved him from the woman he had once pledged to cleave unto. How fascinating!!! I have never really read anything about these two, but it does make me want to now! I am not materialistic but I do love certain things for not what they are worth but what they represent on a historical or emotional level. Hugs. Compelling! So we knnow that the Duc was a dog, but what happened to Louise Marie? The people have a right to know! The Duc de Chartres was sent to the guillotine on 6 November 1793 and a few days later, his poor wife, Louise Marie Adelaide, was arrested and imprisoned at the Luxembourg Palace (it became a prison during the Revolution). I believe she would have followed in her husband's footsteps had not serendipity/fate intervened in the form of Jacques-Marie Rouzet. Rouzet was also a political prisoner (a former member of the Girondins). Louise Marie fell hopelessly in love with Rouzet, and he with her. Rouzet was released from Prison first and went on to become a member of the Council of Five Hundred. He used his authority and sway to gain Louise Marie's release. In 1797 Louise Marie was forced into exile. Rouzet followed her and they remained together. They returned to France in 1814, at the time of the Bourbon Restoration. Louise Marie fought for her estate and monies to be returned to her and won. She died in 1821 of breast cancer (which is also what killed Louis XIV's mother, Anne of Austria). This is so interesting. I love history and look forward to studying your blog in more detail. Thank you, Petit Minou. I hope you continue to enjoy my blog. It's very interesting to see those rings! The Duc de Chartres/ Duc d'Orléans was a real villain, wasn't he? Nonetheless, I've lately become very interested in the whole Orléans clan, because I'm fascinated by the Belgian royal family and the first queen of Belgium was an Orléans princess- the granddaughter of Louis-Philippe Joseph and Louise Marie Adelaide. Thanks for this post! Thank you for visiting my blog and taking the time to leave such kind comments. I appreciate it. The Orleans clan has some interesting figures in it. Good luck in your research and let me know if you come across any particuarly good materials. Hmm...I tried to leave this comment before, but it doesn't seem to have worked...I hope it doesn't now show up multiple times.